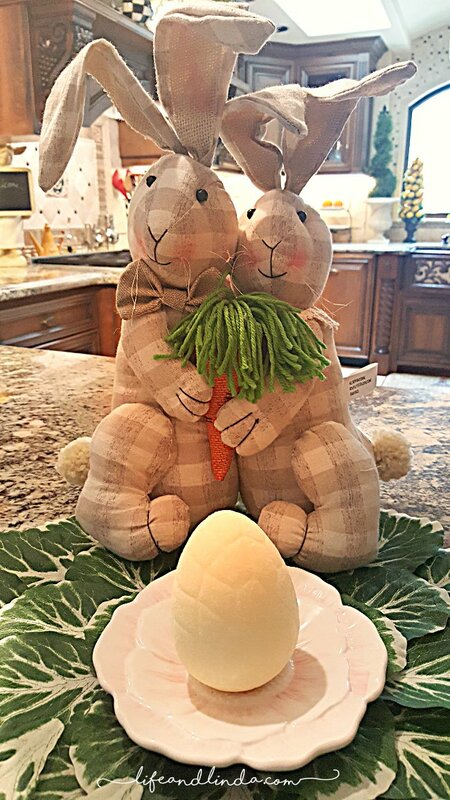 Home / bunny / Easter / tablescape / Some Bunny Loves You! 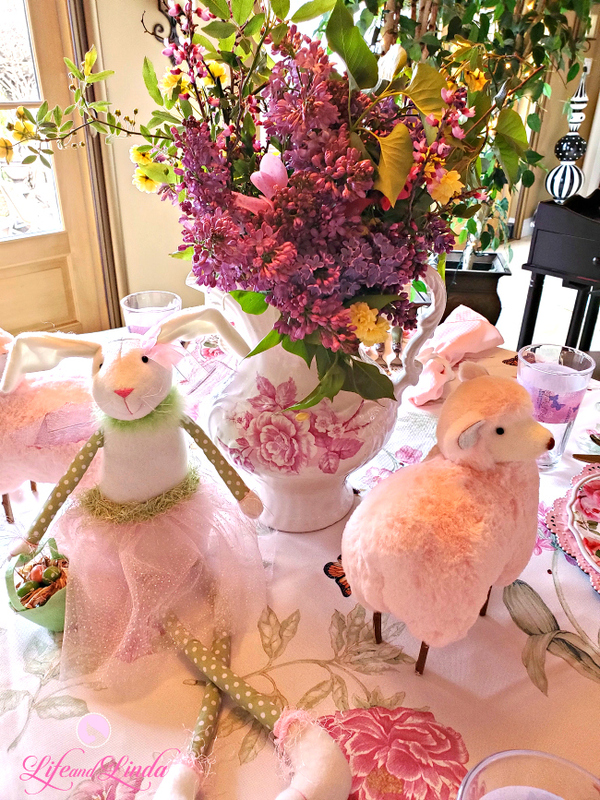 A very sweet table for Easter with traditional colors of pink, green and cream. The tablecloth has butterflies, lady bugs and flowers. I am using the pintuck tablecloth I used for the Blue, gold and cream table. 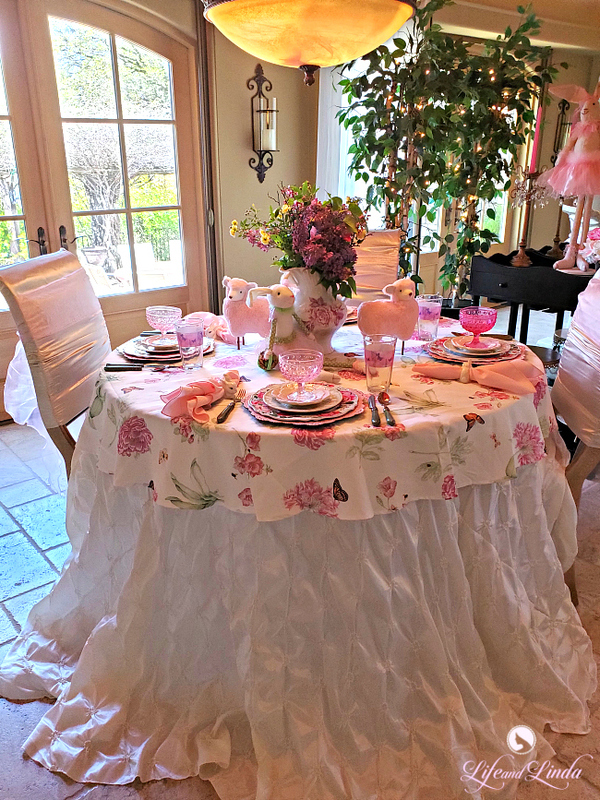 I just added another 70" tablecloth with pinks, greens, cream. 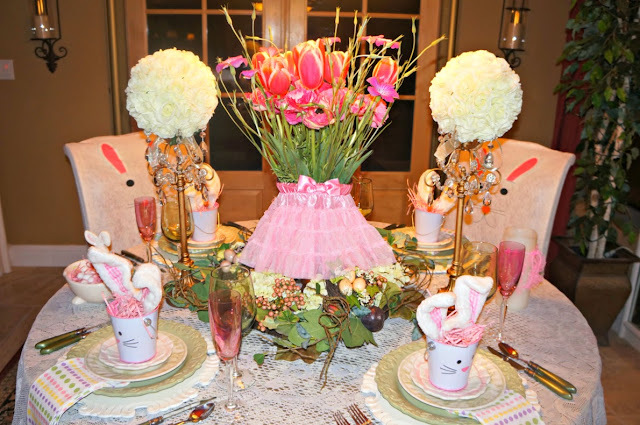 Notice the adorable bunny napkin ring? A find online. Pink chargers are from Michaels. It's great when they are on sale. The rose dinner plates are from Ross, along with the green salad plates, in addition to the small pink rose plates. The flowers I cut from our yard. 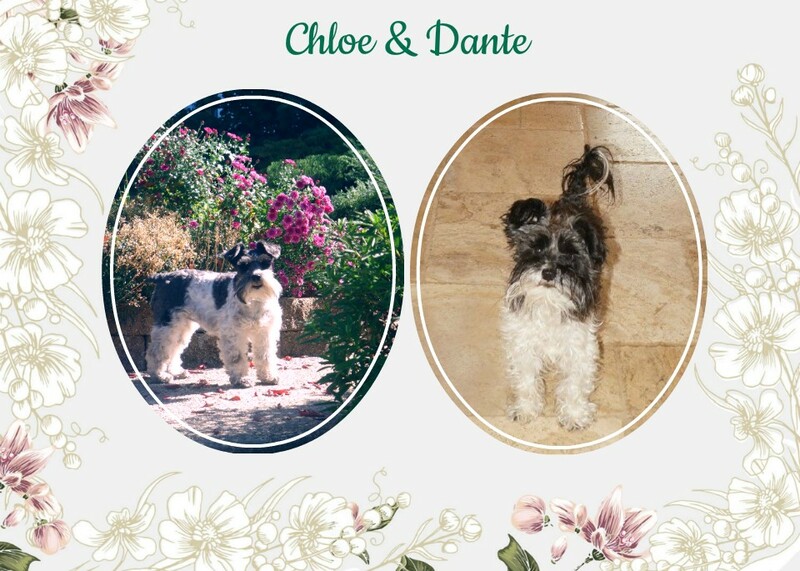 Spring has sprung and the flowers are blooming. Lilacs, lavender, rosemary, Lady Bank Roses and even the wisteria is coming on. Gotta love this time of time. These pink lambs I got for writing a sponsored post. Their sweet faces make you smile. A closeup shot of the centerpiece. 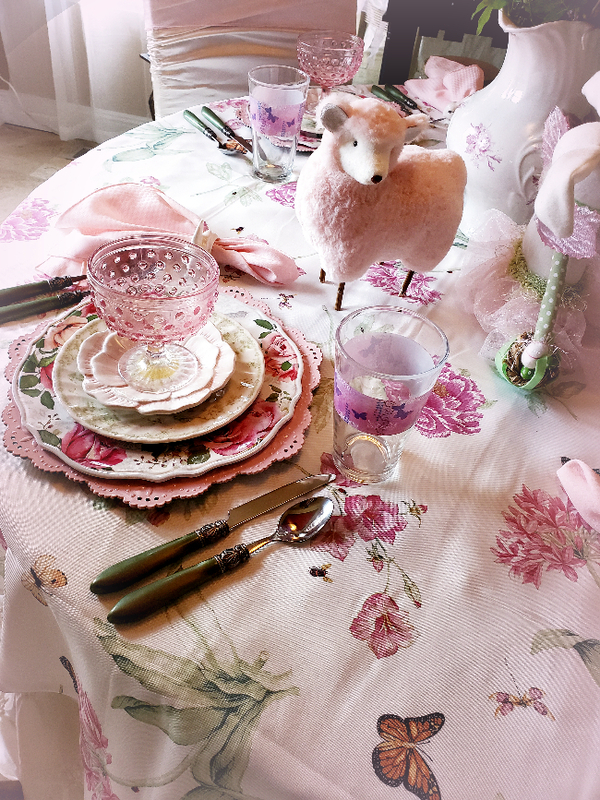 Miss bunny is casually sitting on the table along with two lambs. This cutie patootie bunny is so sweet. 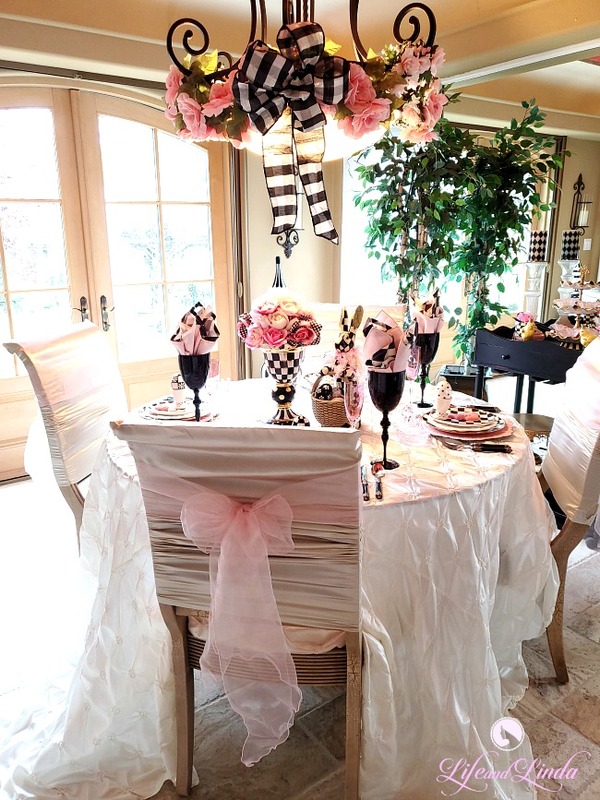 Pink chair sashes really make the chairs pop. 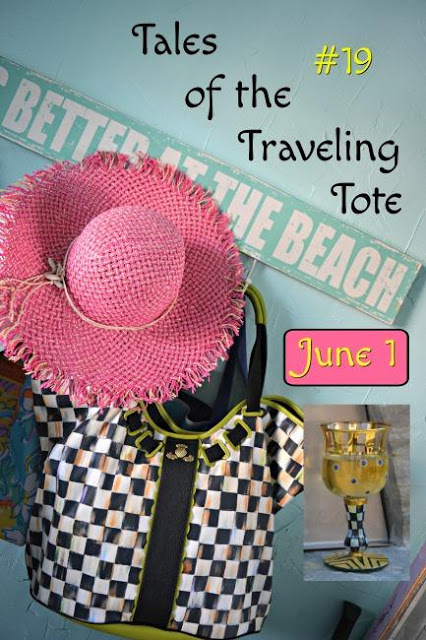 They are inexpensive and come in all different colors. 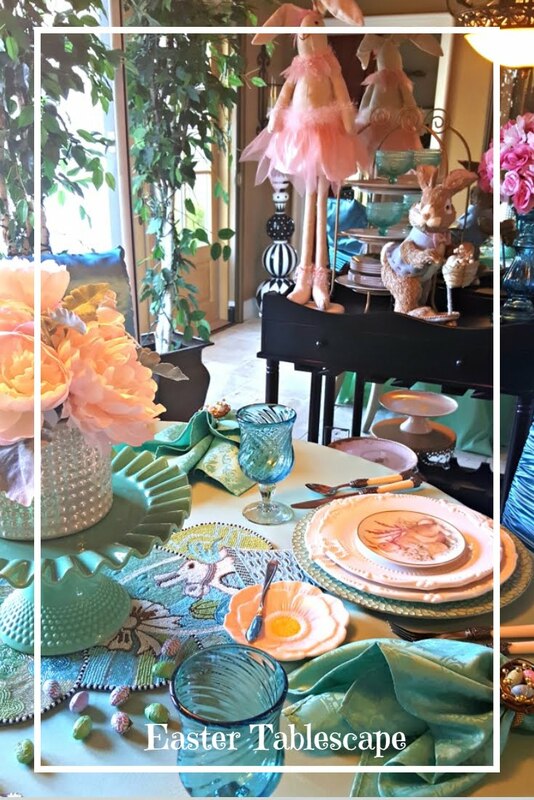 Check out some of my former Easter tables. Linda, This table is just BEAUTIFUL!!! I love every single thing on it! I can't believe all those flowers came from your yard -- you've got a seriously green thumb. :D Such a pretty flower arrangement and pretty pitcher to display them in. 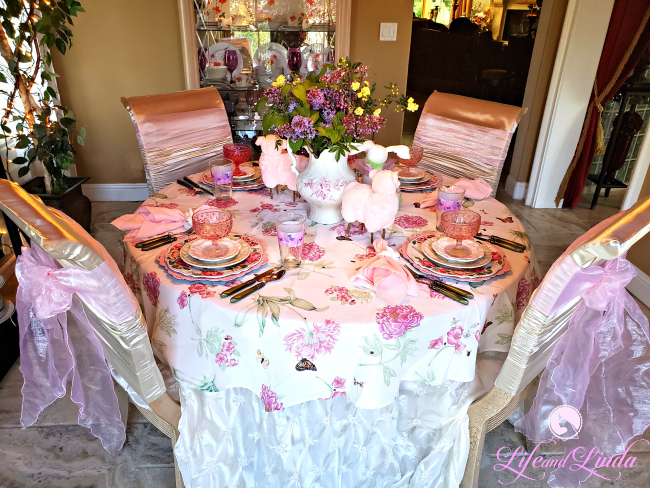 I also love your tablecloths and your pink napkins, as well as the bunny napkin rings. Of course, the pink sheep are precious. <3 <3 You'll have to check out my sheep pictures from Sunday's post. I hope you're doing well, Linda. I so enjoyed seeing your pretty table -- have a great week! 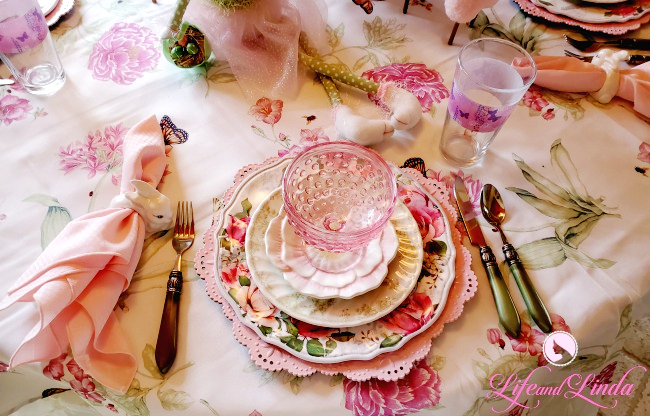 Linda, you create the prettiest table settings and this one is so sweet and adorable! Just perfect for Easter! 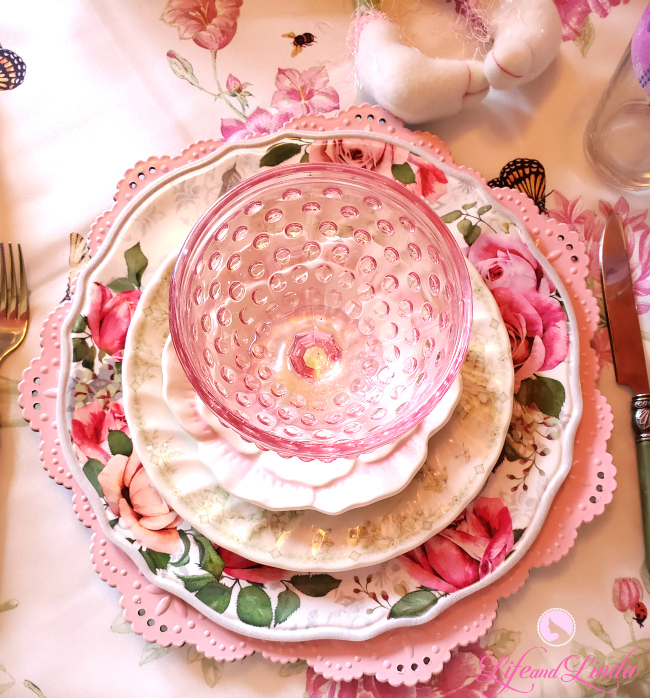 It's a pretty in pink tablescape that brightens the room! This table is just beautiful. I love that you could bring in flowers from your yard. 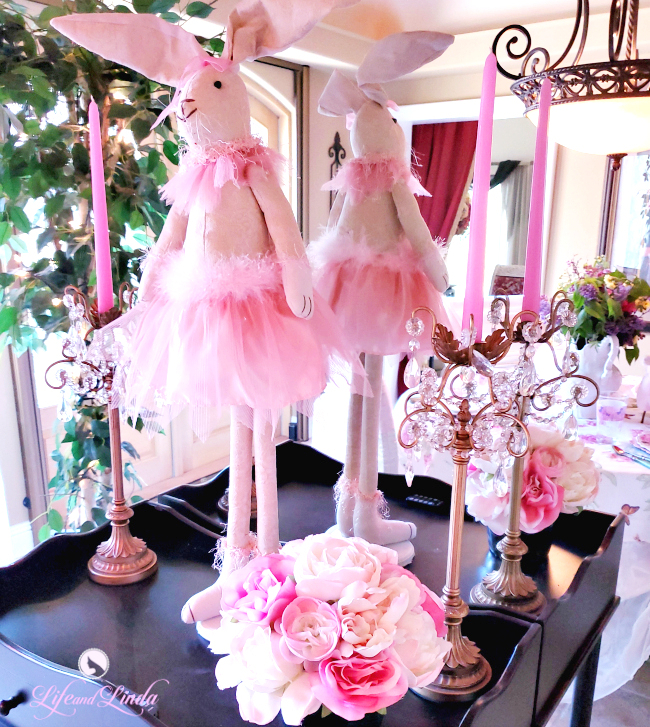 Love that table cloth skirt and the bunny napkin rings. Have a great day sweet friend. 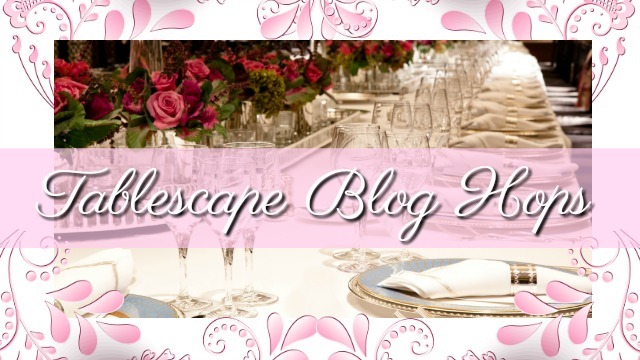 Ooh I love the double tablecloth idea and it's so pretty! Love the dish stack, the cute lambs and bunny and of course the cute bunny napkin rings! Lucky you to be able to cut fresh flowers for your arrangement! Everything looks lovely at your table, Linda. 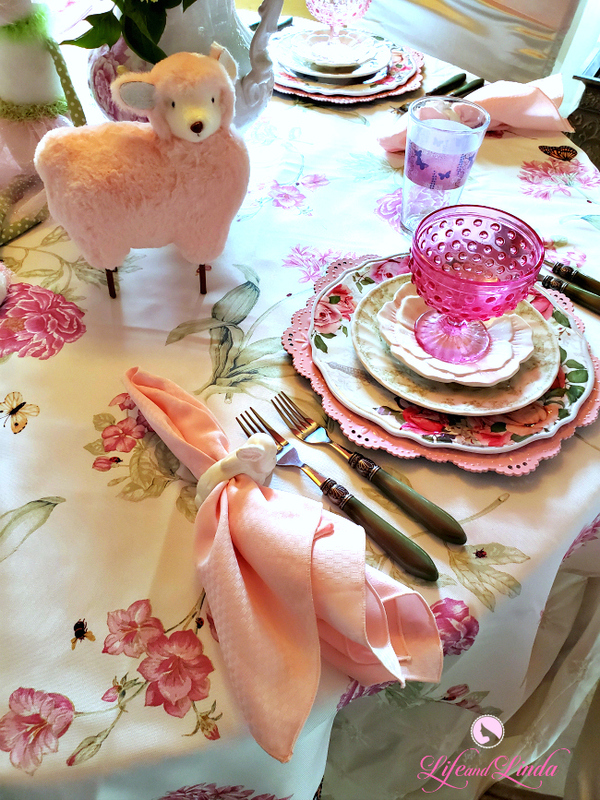 Love the tablecloth and the lambs are darling! I have a thing for them! So pretty, Linda! So pretty and elegant. I love the color pink. Have a Blessed Holy Week. 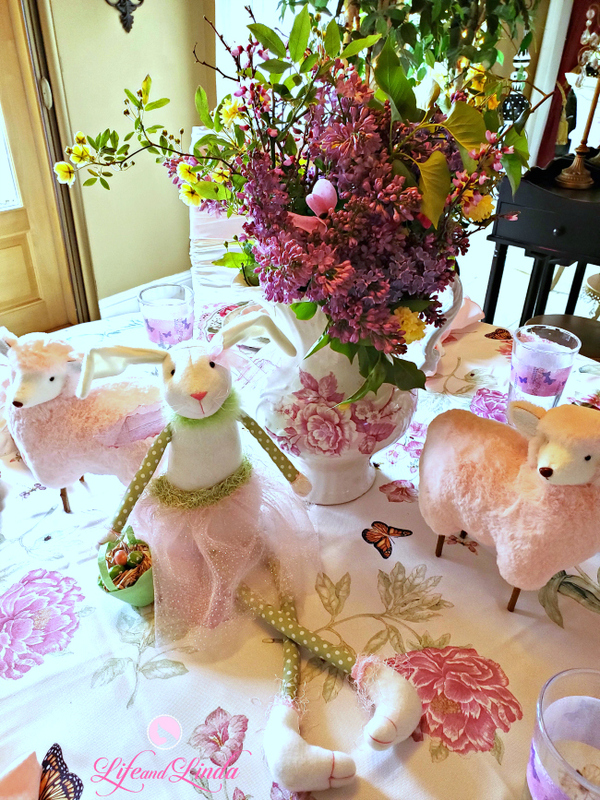 This is the cutest Easter table I've seen in a while! 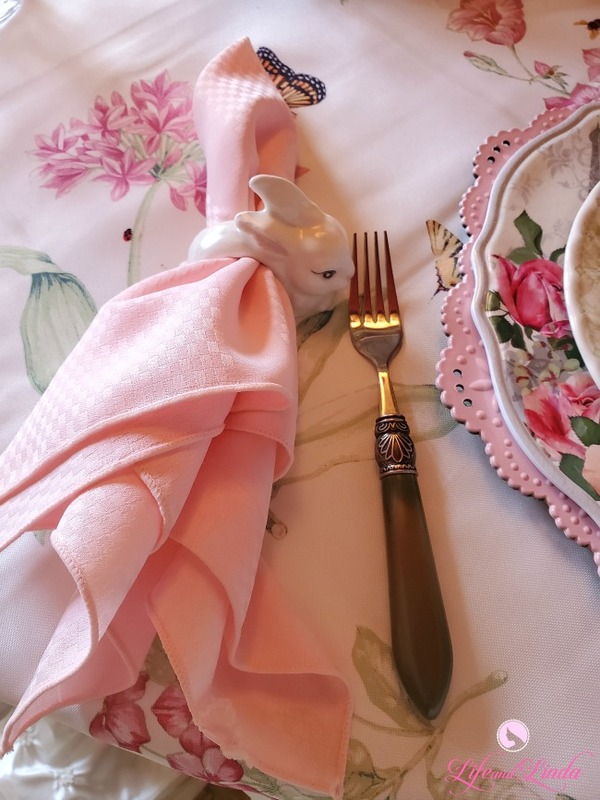 The little rabbit napkin ring is so pretty and those lambs just make the scenery even more stunning. Love the color choice, it's so romantic and tender! I am wondering if you could contact me . I am interested in a new blog design on wordpress, not sure if you do that, but if you do, I would love to talk to you about it. Thank you Mary, I tried to email you, but your email address bounced back saying that address does not exist. I left a message on your blog as well. 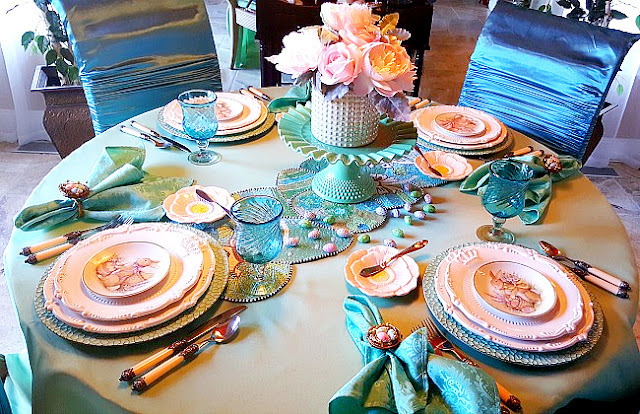 Hello Linda, wow you decorated a gorgeous looking table for Easter. 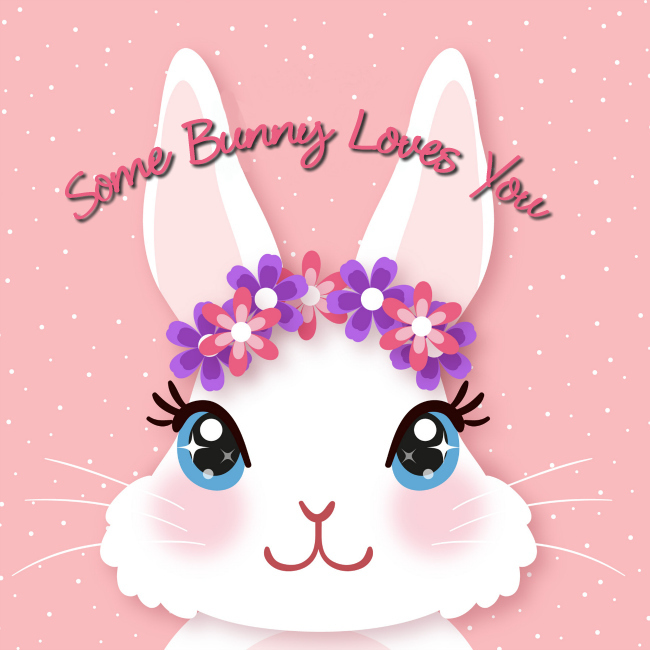 I love the cute bunny and the pink sheep are just adorable. I hope you have a nice Friday and weekend. Everything looks so Eastery. Very pretty setting. Im adoring the bubble glass. 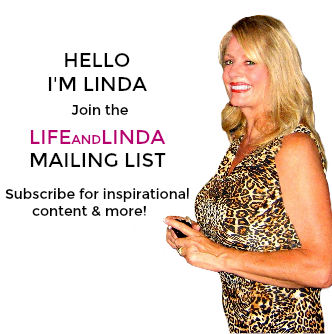 Oh Linda, this is so so sweet! 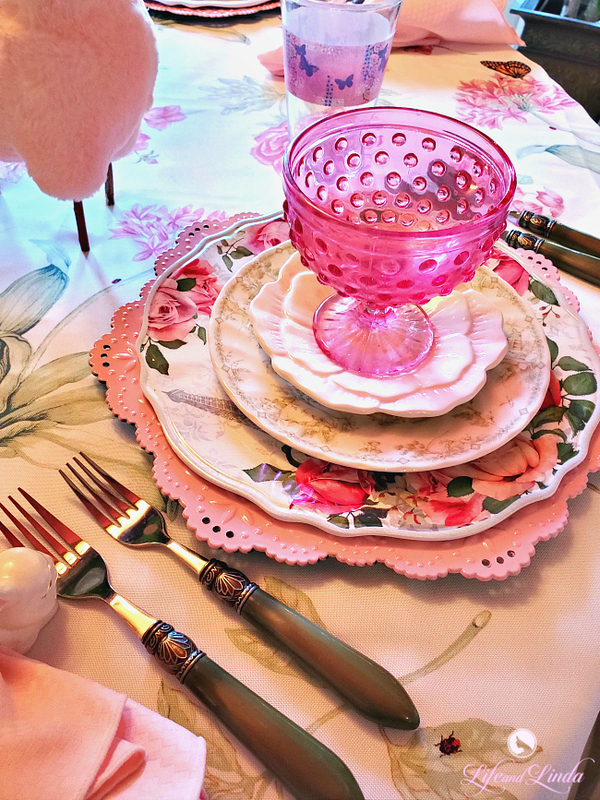 You should invite your girlfriends over for an Easter tea! Gorgeous and adorable at the same time! Have a wonderful Easter!